It was very interesting to hear Lewis Hamilton talk about his desire to tick the box of winning in Japan pretty much as soon as he was done with victory in Singapore last Sunday. It reminded me of the moment after he won the British Grand Prix, when he complained that they did not have the traditional gold trophy out on the podium. It's very easy to forget that things like that matter to this modern generation of racers, who have gone straight from school to being professionals. Hamilton is more mature this year, but he is still very much the same man underneath - what you see is what you get. That his attention was immediately on Suzuka showed his focus on the wider goal - he had already moved on from his victory in Singapore, important though it was. And it demonstrates his hunger and passion for the sport. Suzuka is one of the great challenges on the grand prix calendar. Hamilton knows that in the past greats such as Ayrton Senna, who he particularly looks up to, have had career-defining moments there, whether good or bad. And the same goes for modern-day greats - and Hamilton's rivals - Fernando Alonso and Sebastian Vettel. Hamilton does not have a particularly good record at Suzuka so far, and he understands what winning or driving a great race there means to an F1 driver's legacy. That continually adds layers of greatness to an already great driver. He is respectful of and motivated by the past. Hamilton has mentioned on regular occasions over the season the fact that he had had the worse of the reliability and bad luck at Mercedes but he did not do that after Rosberg's retirement in Singapore made things more even. That is a demonstration of his mantra of life - which in simple terms is, "What's for you won't go by you". There is a gentleness and kindness wrapped into the manner with which Hamilton goes about being a very focused and determined driver. He has no problem doing things that might make things uncomfortable for others if he believes it is fair and justified - such as telling the world what Rosberg had said about their collision at Spa this year in the private meeting afterwards, or showing team telemetry. But there is an inner respect to him. If you cross him, he will respond at that moment. Yet once he is back into his normal mode of quiet reflection, it is all gone. In the car, he is an instinctive, intuitive, dynamic racer - and the way he talks in the car reflects that. But the minute he takes his helmet off that goes away. You only see him punching the air when he has his helmet on, for example. And, yes, he does a victory wave on the podium. But it's a modest one; much more him connecting with his people than a "Yeah, I know, I'm brilliant, aren't I?" He becomes a lot more introverted and understated when the helmet comes off. It's like Superman becoming Clark Kent. A few days on from Singapore I still feel a slight sense of disappointment that Nico Rosberg's problems meant we did not get to see what was potentially a great battle out front on one of the most physically demanding race tracks on the calendar. Typically, Rosberg is more of a sweater than Hamilton, which is nothing to do with how fit they are, it's just genetics. But we could really have seen the physical aspect of the two of them - where they're at, how hard they are prepared to push behind the wheel. Some would say that it is only fair that the balance of reliability issues between Hamilton and Rosberg is more even now, and I can sympathise with that. But the history of F1 has very often been not only about who was the quickest guy over a season, but also who happened to be the most fortunate in terms of reliability. Nevertheless, in many ways it was the rightful result to balance things up a bit more and it gives us a great run into what is effectively this last six races - five events, but double points in Abu Dhabi. Rosberg did all the right things after his disappointment in Singapore, but then coping with problems is part of what being a professional racing driver is all about. If you can't handle losing, you are in the wrong sport - a grand prix driver or a team will always lose more than they win over time, that's just the way things are. Can Rosberg prove his greatness? There is no question Rosberg has been affected by the fall-out from his collision with Hamilton in Belgium last month - for which the team blamed and reprimanded him and forced him to apologise publicly - and the booing from the fans he received in Spa and Monza. He's only human and he does not have the aloofness of, say, Michael Schumacher when it comes to those situations. Add that to Singapore, where he retired and saw Hamilton take the championship lead, and he must be deflated. He simply has to be. Psychologically, when you are behind on points you are naturally a little down. He knows it is all still to play for, but now Hamilton is ahead - even if it is only by three points - Rosberg knows the stakes are higher. At the moment, you get the impression Hamilton is better equipped to deal with that, even if it is only because he has been there before. But the championship is still there for Rosberg to win, and in many ways these five races to the end of the season will define how he is perceived. If he can beat Hamilton in a straight fight, it will elevate him from being a very good racing driver to being an exceptional one. There have been many very good F1 drivers, but very few true greats. They are the serial winners, the ones who when push comes to shove won't let go. They'll somehow motivate themselves and the team to get behind them and give them that last little bit of support, and they'll reflect that with performances in the cockpit that others cannot match. 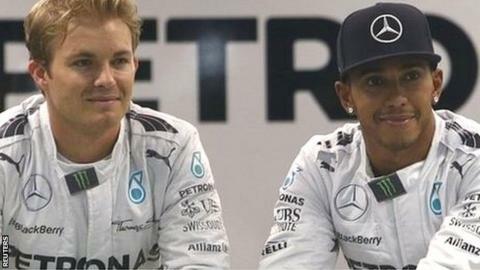 Rosberg does not have to prove he deserves his place in the Mercedes team - that is unquestioned. But a world championship up against Hamilton would put him on another level. It is difficult for those of us of a certain age to put Hamilton up there with the likes of Ayrton Senna in terms of greatness. You always have a soft spot for the drivers you watched when you were growing up. But, in terms of absolute speed, that is Hamilton's stature in this era, and Rosberg will relish what going up against him means. It should be wonderful to watch.